The LilyPad is based on the Arduino platform, but in a form that makes it easier to incorporate into wearable projects. As well as the main microcontroller, there’s a broad range of input and output add-ons under the LilyPad brand that are all designed to look good and to work with conductive thread. Limited outputs make it not ideal for more complex projects. 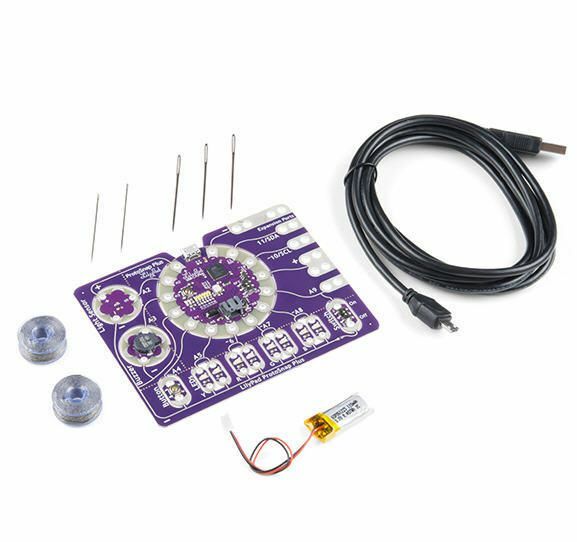 The LilyPad ProtoSnap Plus Kit is an all-in-one e-textile prototyping kit that has been specifically designed to make it as easy as possible to incorporate electronics into any of your garments or fabrics. The LilyPad ProtoSnap Plus is a sewable electronics prototyping board that you can use to explore circuits and programming, then break apart to make an interactive fabric or wearable project. Programming the ProtoSnap Plus is easy with the free Arduino software you will need to program the ATmega32U4 on LilyPad USB Plus at the heart of the board. Once you have installed the software, you will be able to write and upload your own programs to the board, making it do almost anything you want. This is a good introductory e-textile kit. With all the parts combined and the featured activity guide, you will be able to plan and create fantastic projects in no time! Please be aware that the Lilypad ProtoSnap Plus Kit is not supported on Windows 7 or 8 due to a lack of support drivers for those specific OS’s. Delivery information: Included on the ProtoSnap are 1×LilyPad USB Plus; 1×LilyPad Light Sensor; 1×LilyPad Buzzer; 1×LilyPad Button; 1×LilyPad Switch; 2×LilyPad LED - Yellow; 2×LilyPad LED - Red; 2×LilyPad LED - Green; 2×LilyPad LED - Blue; 5×Expansion Ports.Kit also includes 2×Conductive Thread Bobbin; 1×Needle Set; 1×110 mAh LiPo Battery; 1×USB micro-B Cable - 6' .